You've probably figured out that your living room is the largest area of your home. 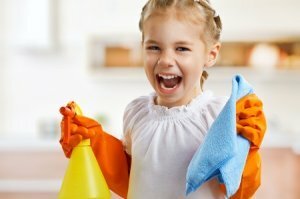 Kids age 3 to 5 can help with living surface cleaning. There's so much to clean! The good news is that your kids will be able to help with just about all of it. Your living room and living areas will be spotless in a jiffy once you enlist your kids' help. Here's a guide to which living room chores kids can do at what ages. Once a child reaches a certain skill or age level, he can generally do the chores for his group and those for the age groups below. Of course, some of these chores need to be done each day, others once a week, and still others once a month or even less frequently. Use your best judgment for which living room chores get done when. Turn off the TV if button is within reach. Take indoor plants outdoors for a gentle washing. Vacuum floors and carpets and move furniture to clean underneath.